Self-drive Holidays in Italy for the Independent Motorist. Northern Italy is a country of scenic contrasts, rich in history. From the mighty Alps and Dolomite mountains, cut deeply by great rivers and glorious lakes, the land falls away to the vast plain of the River Po and its tributaries, which flow into the Adriatic close to Venice, truly one of the wonders of the world. In the west the Italian Riviera is a coastline of beaches and high mountains extending almost to the sea. Everywhere are ancient towns and cities, testament to some of western civilisation's greatest achievements, while the modern industrial and commercial cities of Milan and Turin ensure Italy's place in the modern world. 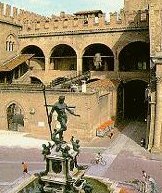 Bologna, a busy and bustling city, has one of Europe's oldest universities, and is a fascinating place to stroll around, with its many medieval towers, arcaded streets, historic churches, palaces, galleries and museums. Bologna also enjoys an enviable situation on the southern edge of the central plain, close to the foothills of the Appenines, which offer many possibilities for walks and drives among beautiful mountain scenery. The seaside resorts of the Adriatic coast are just 80 kms distant, as is the beautiful town of Ravenna with its wonderful mosaics. Cannobio is just one of the delightful resort towns around the shores of Lake Maggiore, one of the lovely Italian lakes. Close to Maggiore is the smaller and peaceful Lake Orta, The other great lakes are genteel Como, playground of the Milanese, and Garda, much loved by the Germans and excellent for windsurfing. All the lakes are set spectacularly between steep and rocky mountains which gradually open out towards the south. Along their banks are established resorts like Como, Cernobbio, Riva and Bellagio, offering an enticing mixture of palm-fringed promenades and majestic villas along with facilities for all the latest in watersports and leisure activities. Ferrara with its spectacular moated castle, is just one of countless Italian cities on the northern plain which deserve a lengthy visit to do them justice. Amongst many, visit the famous university town of Padova with a wealth of ancient buildings; there's Cremona of Stradivarius fame; Mantova has its palaces and historic centre. While you're here, take some time to drive around the flat countryside close to the famous cheese-making town of Gorgonzola, where time seems to have stood still and huge ancient farmsteads still act as a focal point for the villages around. Verona is forever associated with the story of Romeo and Juliet, and Juliet's house, with its famous balcony, is a much visited attraction. The other great draw is the almost perfectly preserved Roman amphitheatre, where open-air performances of the great Italian operas take place throughout the summer. Take a cushion - stone seats are hard! Verona is a great base for visiting the other cities of northern Italy, and is just an hour's drive from lovely Lake Garda and the Alpine foothills. North of the city are countless acres of vineyards producing millions of litres of some of Italy's most famous wines, among them Valpolicella, Soave and Bardolino. Milan is a powerhouse of industry and commerce and, together with Turin, is home to some of Europe's most successful companies such as Fiat and Olivetti. 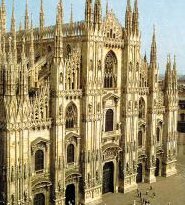 Both cities are sophisticated centres of culture, the opera house of La Scala in Milan being famous world-wide, almost as much for the enthusiasm of its audience as for its wonderful performances. Turin and Milan vie for supremacy as the fashion capital of Europe, and both cities offer wonderful shopping; Milan in its great arcades and Turin along the imposing Via Roma, and the adjoining arcades. Turin probably offers the best in food and wine, while Milan's Cathedral, or Duomo, is among the finest anywhere. There's plenty for connoisseurs of art and history, and all this combined with a lively nightlife, makes a stay in either of these cities a thoroughly rewarding experience. Venice is unlike anywhere else in the world. Set in the lagoon, it is completely dominated by water. Leave your car at the end of the causeway. 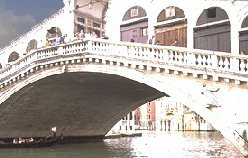 There are no roads, so movement around the city is by motorised water-buses, or, if you're feeling romantic, by gondola. All goods are moved by boat, and all this water-borne activity gives a feeling of being in a city on another planet. As you walk through the narrow streets, wonderful sights are around every corner; palaces at the end of dead-end alleys, small squares with superb medieval churches, canals with their arched bridges; and suddenly and unexpectedly you emerge from some small passage into the brilliant sunlit space of St Mark's Square. Several days are needed to do justice to this amazing city, and try to avoid the mid-summer holiday peak when it can be uncomfortably crowded.